but the same amount health as org Oblivion. I have cleaned this mod with tes edit. My Parents for making me. I had his mod first for suiting my first wishes, but I found his stats a bit to high. And I did not like the load screenbonus in the .esp. So that made me decide to make my own version. But if you like his stats better, than surely use his one! Because all links by Nexus are as usual death. And the site is to often under construction. But i think you can al find this version on Fileplanet too. Which bytheway, I like Planetfiles better. Less annoying and less hypocrite and more common sense. For example someone puts a dirty bestial mod on Nexus. And people who are righteous are offended and think Nexus gives modders a bad reputation are banned. I hope you like my mod and have a nice day! 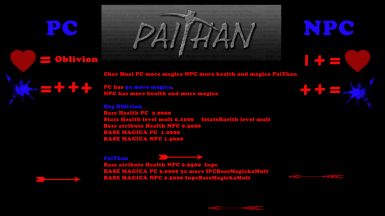 I had made a mod with PC more health and magica and NPC more health and magica. asked if could remove the pc health base and health multiplier tweaks. PC has more magica about 3x but the same amount health as org Oblivion. Do not use together with other mods who are adjusting this. Depending the load order only the last mods is working.